DrainBoss is your local drainage expert in Reigate. DrainBoss provide a comprehensive drainage and plumbing service to both commercial and domestic clients in Reigate and surrounding areas. We are a family-run, independent drainage and plumbing company without franchise fees so we can keep our costs low and pass our savings to you. With no call out fee, a price match promise, and a set price agreed before work commences, we provide an excellent service and value for money. Our professionalism and unmatched customer service differentiate DrainBoss from any competition in Reigate. We are available 24 hours a day and 7 days a week to provide a full service and fast response to any drain problem. DrainBoss is a highly reputable and reliable plumbing and drainage company in Reigate. 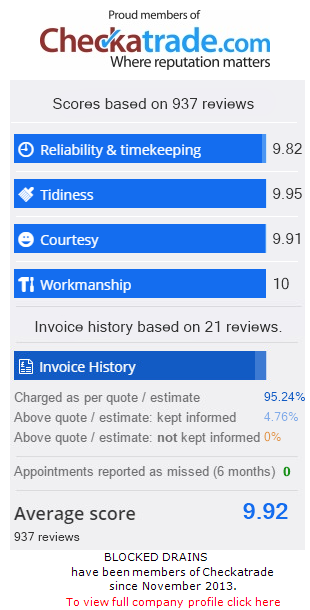 We have an outstanding rating on Checkatrade. We are fully insured, Trading Standards Approved, and CHAS accredited. This gives our customers complete peace of mind that their drainage issue will be resolved to the highest possible standards. All our drainage specialists are fully trained, qualified, and experienced technicians who pay special attention to being courteous and tidy at all times. All our staff are professionally trained to City & Guilds and the highest health and safety standards. We utilise the latest technology and state-of-the-art techniques to clean and unblock your drains effectively and efficiently. DrainBoss is a trusted drainage contractor and we are proud to be the drain company that businesses and residents return to time and time again for all their drain unblocking, drain repair, and drain maintenance needs. DrainBoss operate 24/7 and have the capability, skill, and expertise to deal with all types of blocked drains and plumbing situations in Reigate. For a fast, reliable, and efficient service, call us now on 01737 457789 or 07772 535248.